You mean the 2CR5? It's not common in stores that carry batteries in addition to everything else, but it should be fairly common in camera shops, and online. That would be the one. I used to find them at Radio Shack stores, but we know that story. And the couple of local camera shops either didn't have them or wanted an arm and a leg for them. I get them from the online shop with the river name. Unlike DSLRs, when using a variable aperture zoom lens, the displayed aperture does not change to reflect it when zooming (it always displays the aperture for the widest zoom setting). - Most DSLR users will be familiar with the HyperModes and double-dial operation, on the Z-1 the 'IF' button works similarly to the green button (it resets the exposure in HyperManual to the program line. - Shutter speed & exposure compensation steps are configurable to 0.3 or 0.5 stop steps (I prefer 0.5 as you scroll through them faster). - You can combine auto-bracketing with exposure compensation (i.e. you want to bracket only above or below the meter reading - set auto-bracketing interval and then shift the three shots with exposure compensation - the markers move along the exposure 'number line' showing you where they are). - You can combine exposure lock & Hyper modes - lock the exposure and you can then seamlessly shift between Av & Tv and all the EV equivalent shutter/aperture combinations in the Hyper modes. A pop! a fizz! followed by the most intense flames. It was scary. Beware! I took a chance and bid on a PZ-1p from an eBay seller with low feedback. It arrived today and I put a roll of film through it. So far, so good -- AF works, metering and shutter speed seem reasonable, control wheels function as expected, etc. All my previous film experience is with pretty basic film SLRs, mostly the Spotmatic F and K1000, which have a relatively small feature set. This has a lot more bells and whistles, so is there anything in particular I should be sure to check out and make sure it's working? If something's wrong, but I decide to keep it anyway, who's the go-to person for CLA/repair? I don't think Eric handles AF cameras for the most part. Looks like everyone above mentioned all of the potential failings that I have heard about. I think these are minor problems, overall this model seems to be quite robust and a great value if you want a full featured autofocus body. My PZ-1P is working great and is one of my favorite cameras, with an outstanding feature set, and despite it's size and weight I find it to have excellent ergonomics. I've not had any problems with the plastic bottom or the pop up flash arm. I really like the dual control wheels. Note that some modern DA lenses (like the 50/1.8 and the 35/2.4) made for the crop sensor cameras like the K-70 work great on the PZ-1P (even though the lens doesn't have a aperture ring, you can adjust aperture with the control wheel). I also like my SMC Pentax-F 35-70mm F3.5-4.5 with Macro (1987) on this camera. My TTL flashes work with it (AF-280T, AF-200T, and the AF-360FGZ). I've not been able to find the Pentax grip-strap that was made for it, but I've found that the inexpensive hand straps you can find on ebay can be adapted to work nearly as well. Let us know how you like it after using it for a while. Also, this is a good review of the PZ-1p. There are some links at the end too. Function wise, PZ-1p doesn't have any pitfalls I'm aware of. I have one since 2000 and it still works as it should. The camera outlives its eye cup. the eye cup on mine starts to harden and deteriorate a little but camera is still as good as new. I doubt anyone would repair PZ-1p now. If people are repairing MXs, LXs, and Super Programs, they will repair a PZ1, PZ20, etc. But they seem to hold up rather well. Was this a personal experience? When it comes to batteries, especially lithium batteries, it does seem wise to stick to known good brands. Yes, it happened to me a couple days ago. Luckily I was standing right there when it happened. It just exploded. 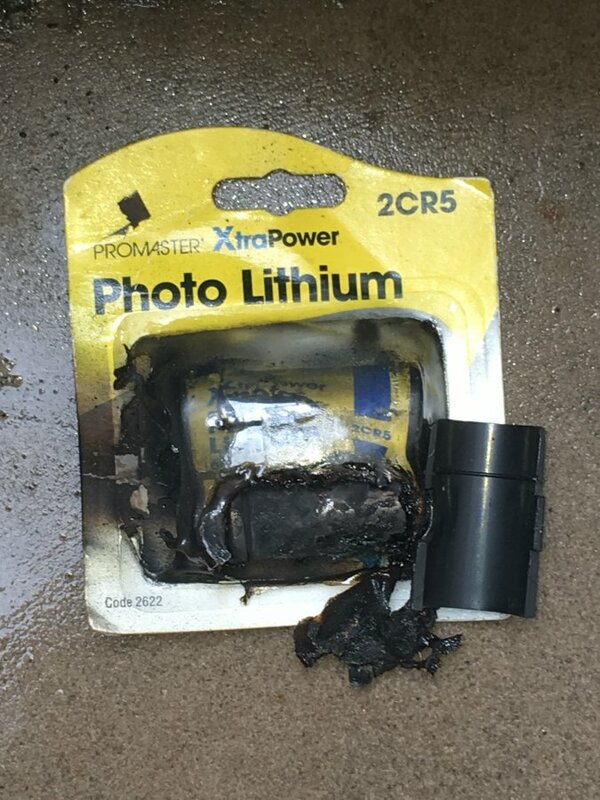 Apparently this is a known problem, and yes not wise going for bargain bin no name batteries.